Ismae shouldn’t be alive anymore. Her mother used a poison to get rid of her when she was still in her womb, but little Ismae was resilient and survived. You’d have to be if you were Death’s own daughter. The old Gods are threatened by the Church, but the people of Brittany still believes and worships them. Ismae will find her part when serving her father, St.Mortmain, and delivering his punishment on the guilty, sending them back to his domain. But what if his desires were more complicated to interpret than Ismae’s convent thought? Grave Mercy was simply amazing. I love straight fantasy novels, and it’s hard to find a good one, but LaFevers’ novel really hit bull’s eye with me! It really reminds me of Poison Study by Maria V Snyder and Graceling by Kristin Cashore. 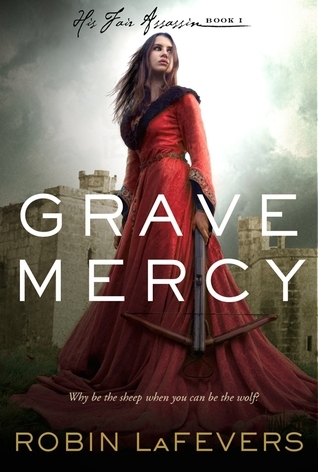 In Grave Mercy, I was able to find this medieval era with its mysteries, conspiracy, treason and secret love. France is trying to conquer Brittany either by force or by forcing the young Duchess to marry one of their man. Many Brittany Duke and Lords are fighting to get their dirty hands on her as well, and all the options are poor ones. Someone is obviously pulling the strings behind the curtains, with their own agenda, destroying any hopes to salvation as they develop and Ismae has to stop the culprit. From the get go, I was hooked. Ismae was sold in marriage at 14 years old and was saved by St.Mortmain’s believers. She was swiped to a convent and offered to serve the God, by learning weapon fighting, poison dealings, feminine arts (to seduce her target!) and much more, therefore become Death’s handmaiden. Thrilled to now have a purpose and play the Hand of Justice to guilty men, her excitement was tangible and got me glued to the pages. The plot is constantly evolving and moves forward at a steady pace and Ismae’s point of view about her duty changed as the story progressed and I loved seeing her mature through challenges. Along side the thrilling atmosphere, the characters were my favorite aspect of the book. Ismae started her journey, if ill prepared, determined to bring Justice to this world, firmly believing in her role. Her beliefs will be shaken up though and she adjusts her actions accordingly, proving that she has a mind of her own and isn’t a simple puppet. Doing so, showed that she was stronger than many could claim and I loved her that much more for it. Duval was, at first, her enemy and I loved loved loved to see their relationship grow. Duval has an hardened shell and strongly believes in his duty to his sister, the Duchess of Brittany, and will do anything for her. Ismae’s and Duval’s duties sometimes clashes and witnessing them deal with the issues was delightful. A real battle of minds! Duval is also a sweetheart and gentleman under this rough exterior and he slowly makes his way into Ismae’s heart. Are his intentions honorable though? Or is she being fooled? The conclusion was heartbreaking and I found myself holding back tears so I could keep on reading. The characters will find themselves between a rock and a hard place and will have to take life-changing, life-threatening decisions. The sacrifices to hold onto Brittany’s freedom will be huge and our strong characters are willing to make them. Not all of them will survive the battle, returning to St.Mortmain’s hands. Ismae will also face a revelation in this moment of sorrow and I truly can’t wait to see how it will affect her future. It kills me that I now have to wait until January 2013 for the sequel, Dark Triumph. Grave Mercy is a long novel at 500+ pages, but I was at the end quickly, wondering how it could already be the end. I want, no, I need more! I would strongly recommend this novel to Fantasy lovers. Mature teens (because it’s violent even though the main character is 17) and adults alike will appreciate this awesome world! I loved this book so much that I pre-ordered a finished copy once I was done reading it! Your review really got me excited for this! I'm very anxious to read this one. Historical + Paranormal = Perfect combo. I am only about 1/4 of the way through and I am LOVING it! I like your comparisons to Poison Study and Graceling, which are two of my favorite books and I cannot wait to find out what will happen.